Historical DVD for: Black History Education. Family Reunions. Juneteenth Events. Libraries. Church Events. "An Eye-Opening Educational Experience That Transcends Race"
for most African Americans in the United States. Gullah is a way of life originating from the introduction of the vibrant West African culture into the nuances of southern plantation life. This intermingling produced a rich diversity of language, food, art and music with its epicenter being Beaufort and the surrounding Sea Islands of South Carolina. Gullah thrives to this day and has extended beyond South Carolina into Georgia, Florida and even Mexico. ORIGIN: "Gullah" is a term that was originally used to designate the variety of English spoken by Gullah and Geechee people, but over time it has been used by its speakers to formally refer to their Creole language and distinctive ethnic identity as a people. The Georgia communities are distinguished by identifying as either "Saltwater Geechee" or "Freshwater Geechee," depending on their proximity to the coast. 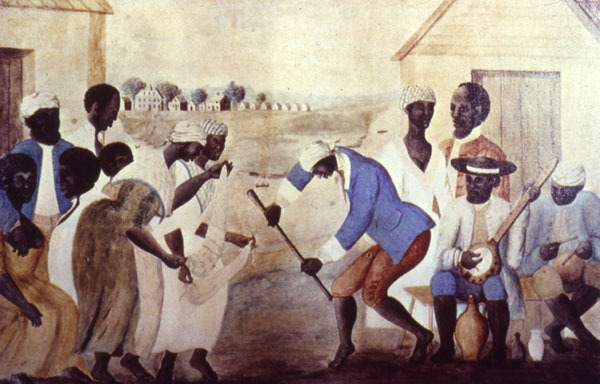 Historian, Joseph Opala states: "The Gullah people are the descendants of the slaves who worked on the rice plantations in South Carolina and Georgia. They still live in rural communities in the coastal region and on the Sea islands of those two states, and they still retain many elements of African language and culture. 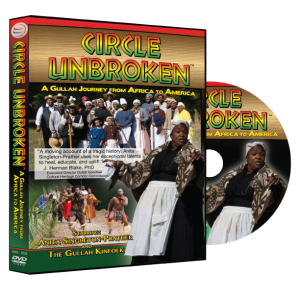 "Anyone interested in the Gullah must ask how they have managed to keep their special identity and so much more of their African cultural heritage than any other group of Black Americans. "The answer is to be found in the warm, semitropical climate of coastal South Carolina and Georgia; in the system of rice agriculture adopted there in the 1700s; and in a disease environment imported unintentionally from Africa. These factors combined almost three hundred years ago to produce an atmosphere of geographical and social isolation among the Gullah which has lasted, to some extent, up until the present day." THE story of virtually every African American and should be a must-viewing for all ages and races. "Black History is too rich for just one month." Black History Education. Family Reunions. Juneteenth Events. Libraries. MLK Birthday. Church Events. Gullah cuisine is considered as one of the oldest traditions practiced in America today. If you consider the history of Gullah and its ties to slavery, it would be no surprise that Gullah recipes have their roots in “need, availability and environment” as much of the resources had to come from the land or surrounding waters. It is not uncommon to find much of Gullah food centered around one-pot dishes, especially using rice, boiled and steamed seafood and a prolific use of standard and natural seasonings. Deep frying is also quite popular and you will often hear reference to a “distinctive taste” when describing Gullah cooking. There is typically a passion and creative expression that can only come from strong ancestral ties, thus making Gullah Cuisine a cultural phenomenon. 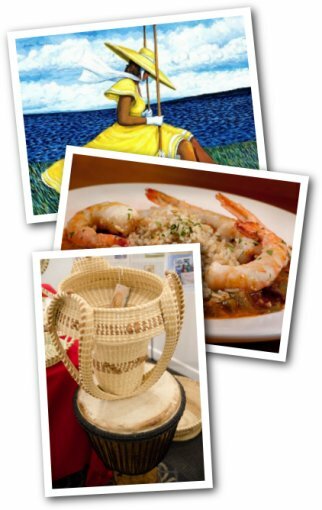 Perhaps nothing is as representative of Gullah Crafts as the iconic sweetgrass basket. This exquisite art form was brought to the lowcountry of South Carolina in the 17th century by enslaved Africans from West Africa, primarily from the regions today referred to as the Mano River Region, Senegambia and Agola-Congolesse. Early basket making in the United States went hand in glove with rice cultivation on the Southeastern coast and the intricate network of plantations. It is noteworthy that typically enslaved African men made the baskets for use on the plantations and often basket making was relegated to the men who were no longer able to work the fields due to age or infirmity. Baskets were made from bulrush (also known as rush). After Emancipation sweetgrass baskets transformed from the larger baskets used in rice cultivation to small baskets made by women. These smaller baskets were used in various environments for storing and serving food and this is believed to have been the turning point from an agricultural craft to a legitimate artform. 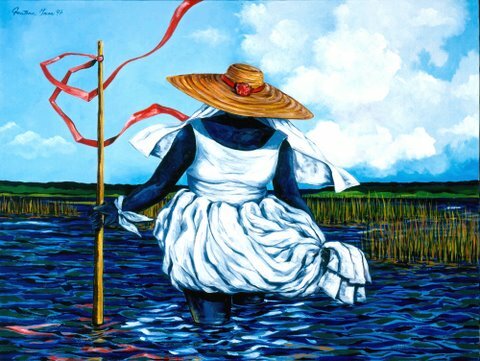 Gullah art is distinctly African. Enslaved Africans and those Gullah who lived in the period of isolation that followed Emancipation, made a wide assortment of artifacts bearing great similarity to from West African art. Wooden mortars and pestles, rice “farmers,” clay pots, calabash containers, baskets, palm leaf brooms, drums, and hand-woven cotton blankets dyed with indigo. Gullah men continue the tradition of wood carving, making elaborate grave monuments, human figures, and walking sticks. Gullah women sew quilts organized in strips like African country cloth, and keep the tradition of the sweetgrass basket alive today, especially in the Mount Pleasant community just outside of Charleston, South Carolina. 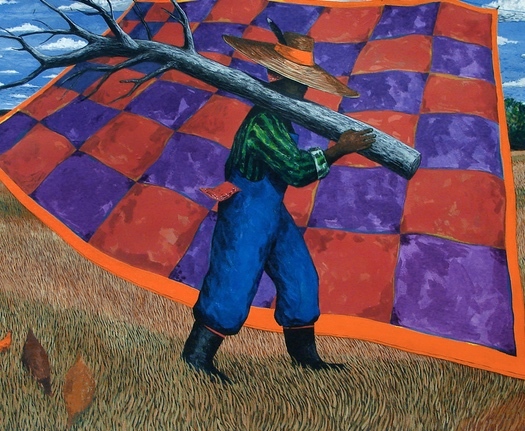 Gullah painting is traditionally very vibrant and colorful with subjects typically centered around community life, as is very evident in the works of Jonathan Green and Diane Britton Dunham. Locals say 90 percent of the people on St. Helena go to church weekly. An impressive figure, considering Gallup recently found only 42 percent of Americans regularly attend church. 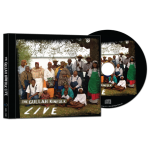 The descendants of African slaves, the Gullah have preserved significant elements of their West African culture, such as their African-based Creole language and their expertise in sweetgrass basket-weaving. “Like in Africa, we [Gullah] have always centered our lives around faith,” says one resident. "For example, until not too long ago, the religious and community leaders of the island resolved most quarrels among themselves. News reports recount an incident in the 1950s when two men involved in a shooting on the island were brought to the local Praise House — a small building used for local religious meetings — to resolve the dispute. When the shooter agreed to pay for the wounded man’s injuries, all was forgiven and the men became friends again. “The Bible tells us don’t go to bed angry,” which became the practical manner in which they resolved the situation. Historian, Joseph Opala writes: "The Gullah culture seems to emphasize elements shared by Africans from different areas. The Gullahs' ancestors were, after all, coming from many different tribes, or ethnic groups, in Africa. Those from the Rice Coast, the largest group, included the Wolof, Mandinka, Fula, Baga, Susu, Limba, Temne, Mende, Vai, Kissi, Kpelle, etc. — but there were also slaves brought from the Gold Coast, Calabar, Congo, and Angola. "The Gullah slaves adopted beliefs and practices that were familiar to Africans from these widely separated regions. In most cases, therefore, we cannot say that a particular Gullah custom is from a particular African tribe; but we can often point more generally to West Africa, the Western Sudan, the Rice Coast, etc. And Gullah traditions are not, of course, all purely African. "The Gullah slaves borrowed practices from their white masters, but they always gave these an African spirit. 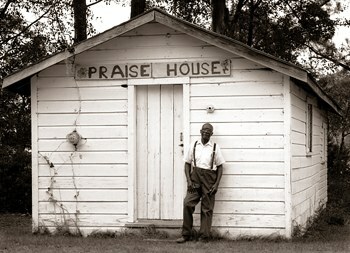 The Gullah became Christians, for instance, but their style of worship reflected their African heritage. In slavery days they developed a ceremony called "ring shout" in which participants danced in a ritual fashion in a circle amidst the rhythmical pounding of sticks and then, at the culminating moment, experienced possession by the Holy Spirit while shouting expressions of praise and thanksgiving." A research article was published by BMC Biology (Authors: Bert Ely, Jamie Lee Wilson, Fatimah Jackson, and Bruce A. Jackson, 2006) titled: "African-American Mitochondrial DNAs Often Match mtDNAs Found in Multiple African Ethnic Groups." This comprehensive research paper states that the Atlantic slave trade resulted in the forced migration of an estimated 11 million Africans to the Americas. Only 9 million are thought to have survived the passage, and many more died in the early years of captivity. Historical accounts indicate that virtually all enslaved Africans brought to North America came from either West or West Central Africa. A recent comparison of mtDNA sequences from 1148 African Americans living in the US with a database of African mtDNA sequences showed that more than 55% of the US lineages have a West African ancestor, while fewer than 41% came from West Central or South West Africa. In North America, different constellations of African groups were brought to various staging areas. Among the important staging areas for the arrival and distribution of enslaved Africans were the ports of Savannah, GA and Charleston, SC. Estimates of the origin of enslaved Africans received at these sites are presented in the figure below, with the largest African regional contributions coming from West Central Africa (40%; contemporary Angola, the Congos, Equatorial Guinea, and Gabon), and the West African regions of Senegambia (23%; contemporary Senegal, Gambia, and northern Guinea), and Upper Guinea (18%; contemporary Guinea and Sierra Leone and northwestern Liberia). Africans in the Carolina coast region were intentionally mixed to reduce the possibilities for successful revolts and to facilitate their assimilation into plantation-slave society. The contemporary Gullah/Geechee culture emerged from these Africans. Two African-American samples, a sample of African Americans who self-identified as Gullah/Geechee and a sample of African-American DNAs obtained from the Armed Forces DNA Identification Laboratory (AFDIL), were compared with both the original and the expanded databases to provide a sense of how increasing the database size impacts the distribution of exact matches. 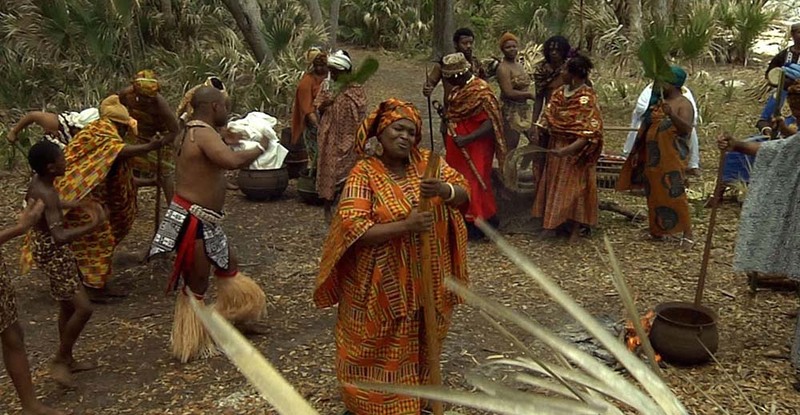 The Gullah/Geechee people are an African-American microethnic group residing in the Georgia/South Carolina Lowcountry and coastal islands whose numbers are now estimated between 200,000 and 500,000 in the Sea Islands of South Carolina, Georgia, North Florida, and beyond. Gullah/Geechee language and culture include unique practices and artifacts (e.g., coiled basketry, Brer Rabbit stories, praise houses) including a distinct linguistic style with roots among the Mende peoples of Sierra Leone, West Africa. When a sample of 74 Gullah/Geechee mtDNA sequences was compared with the sub-Saharan database, approximately half of the mtDNAs were identical to two or more mtDNAs in the database and only seven mtDNAs matched mtDNAs from a single ethnic group. The majority of African-American mtDNAs that were identical to database mtDNAs matched mtDNAs from ethnic groups that were scattered throughout sub-Saharan Africa. However, 41% of the Gullah/Geechee and 37% of the AFDIL mtDNAs that matched database sequences were identical to mtDNAs found only in western (West plus West Central) Africa. Only one Gullah/Geechee mtDNA and one AFDIL mtDNA matched mtDNAs that are found exclusively in eastern Africa in the sub-Saharan database. However, there are many examples of people who, like blades of grass, have broken through and defied the power of the concrete. These are the stories we will tell. The thicker the concrete, the more inspirational the story. Blades of grass cracking the mighty concrete from beneath. Can't keep the entrepreneurial spirit down. "Gullah -- Geechee -- food -- crafts -- art -- religion -- Carolina -- DNA -- Black History Month -- black history presentation -- students -- church -- military -- rubric -- MLK -- school -- ideas -- kids -- civil rights -- women -- Juneteenth -- Martin Luther King -- Diversity -- Charleston"